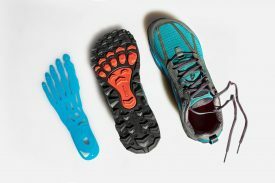 (Logan, UT — July 19, 2018) Altra’s new Lone Peak 4 underwent a complete overhaul from outsole to upper, making this the best version of the brand’s top-selling trail shoe. The mesh low version drops August 1, and is the first of four new shoes in the Lone Peak family. According to data from NPD, the Lone Peak is the number one selling trail shoe in the run specialty channel, and the number five ranked shoe in outdoor specialty shops, impressive for a brand that started just seven years ago. The Lone Peak’s stack height remains the same at 25mm, while its weight decreased to 10.2 ounces for men and 8.5 ounces for women. Color options are green, blue, gray/orange, gray/neon yellow and black/red for men, and black, light gray, raspberry and teal/gray for women. The Lone Peak family offers four different trail shoe styles. The Lone Peak 4 mesh low launches in August, while the Lone Peak 4 mesh Mid and two new waterproof styles, Lone Peak 4 Low RSM and Lone Peak 4 Mid RSM, will launch in September. The Lone Peak 4 will retail for $120 on www.AltraRunning.com or at your local specialty running retailer. Altra’s new Lone Peak 4.0 family and other new styles will be on display at booth #49129-Upper Level at the 2018 Outdoor Retailer Summer Market.